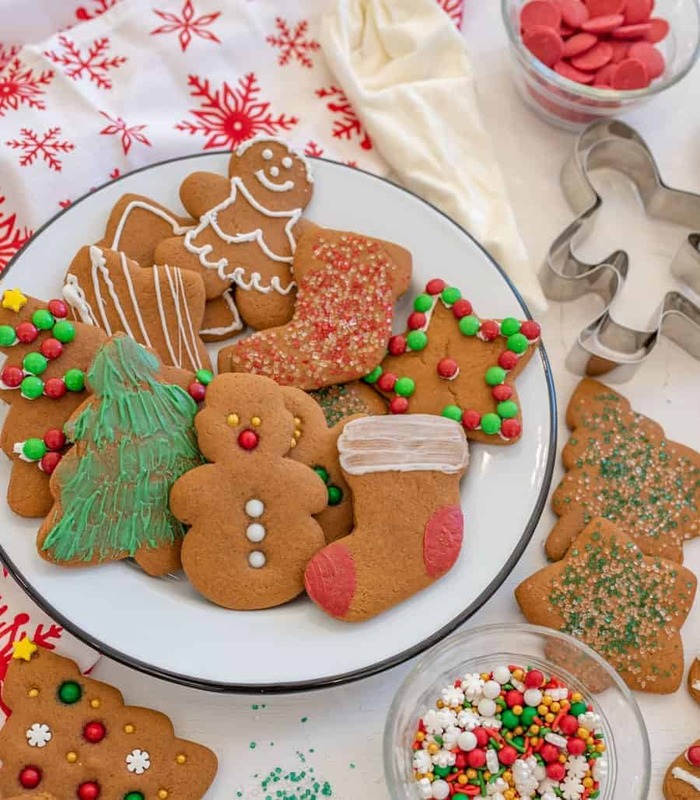 6 simple ways to decorate gingerbread cookies that are easy, pretty, and don’t outshine the simple sweet and spice combo that makes the cookie famous. I LOVE gingerbread cookies and so do you. I shared my all-time favorite gingerbread cookie recipe with you all a few years ago and that recipe has been made time and time again with great success. It’s a solid recipe that turns out perfect every time. The cookies keep their shape when baked and is the perfect balance or sweet and spiced. Everyone loves them! Plus they freeze great so you can make them ahead of time; perfect for the busy holiday season! 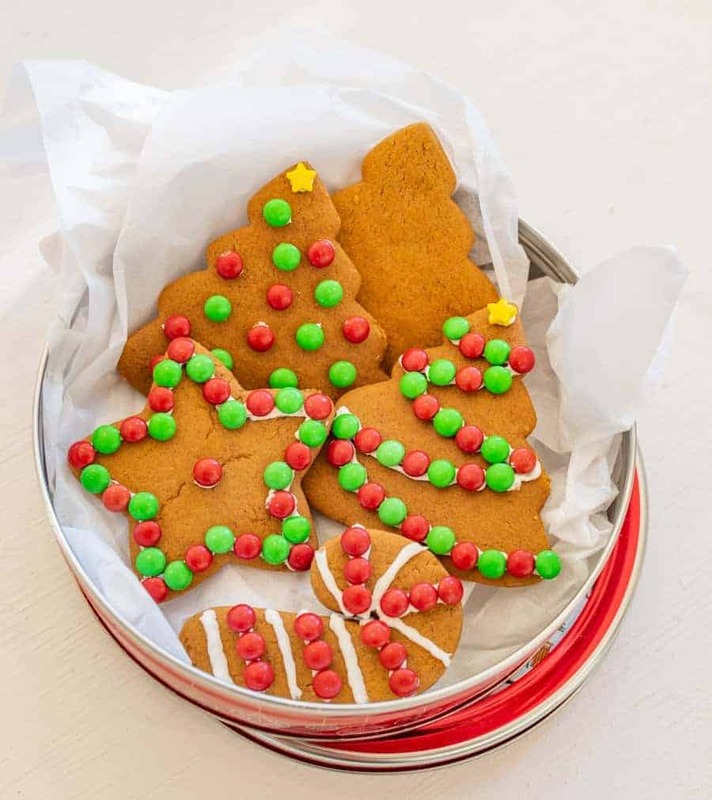 You can find the best Soft Gingerbread Cookies recipe here. Once you have them made, you might be wondering how to decorate them. Let me give you a few tips and tricks on how to make them look great with the least amount of effort on your part. I know that list doesn’t look like much, but that’s the fun of it! 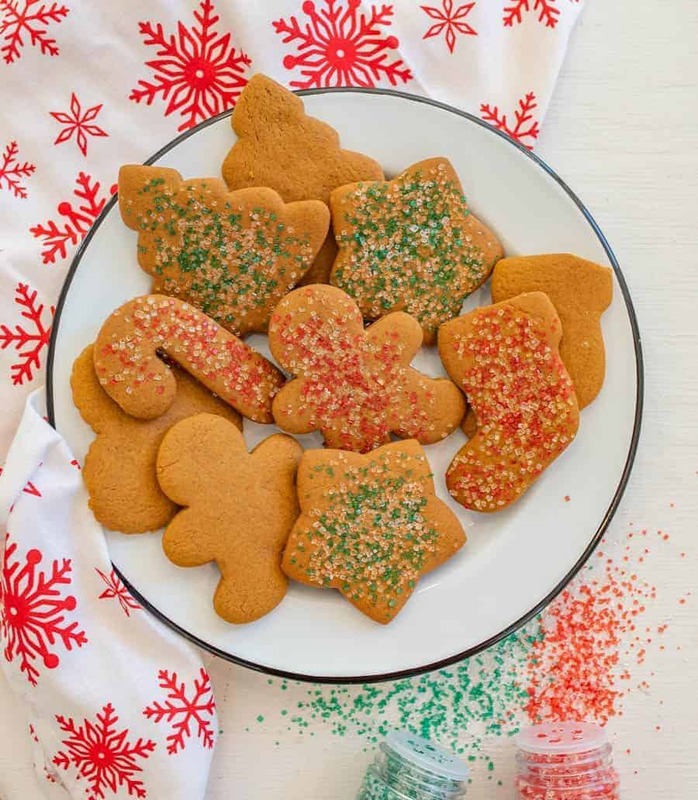 Using a few simple tools and ingredients makes some really unique Christmas cookies without a lot of mess, time, or effort on your part. 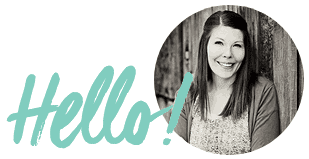 Plus, buying fun sprinkles and festive holiday candies makes me happy. Who’s with me on that one? Keep reading to get more details on all of the decorating methods so that you can easily make these cookies in your own home. 1. Decorate gingerbread cookies with royal icing. 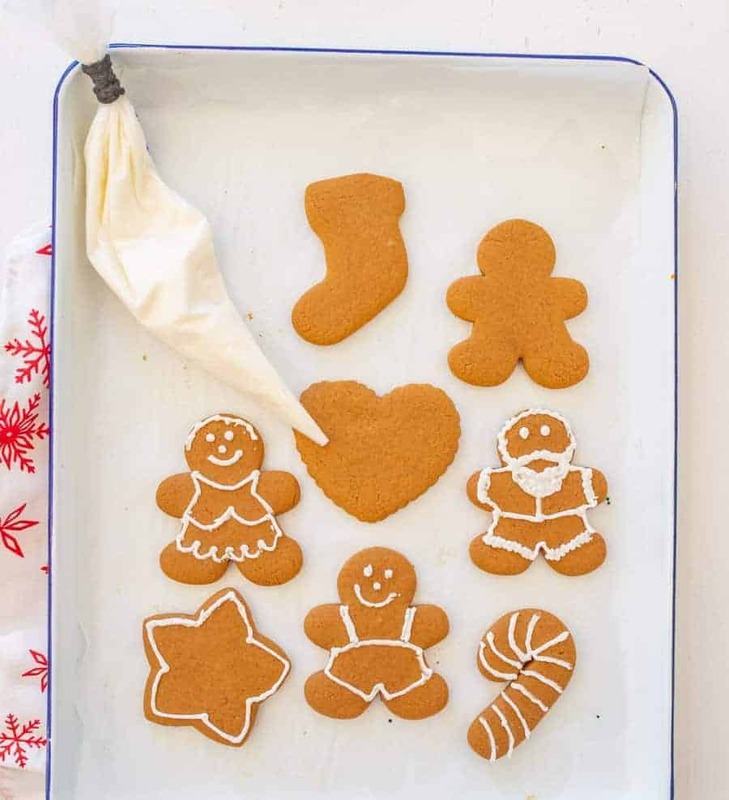 This is the classic way to decorate gingerbread cookies and one that should be first on the list! Royal icing is a very plain icing made from egg whites (or store-bought meringue powder), powdered sugar, and water. It dries super firm, making it the perfect “glue” for gingerbread houses, too. It’s sweet and adds a delicious crunchy texture to the soft cookie. That being said, it’s not so delicious that you want to pile it high on the cookie. Simple lines and outlines are all that you’ll want and need when it comes to using royal icing for gingerbread. I just make this Wilton Royal Icing recipe, put it in a few disposal piping bags, tie off the end, and cut a little of the tip off. This is a really easy way for kids to decorate cookies, too. So simple! 2. 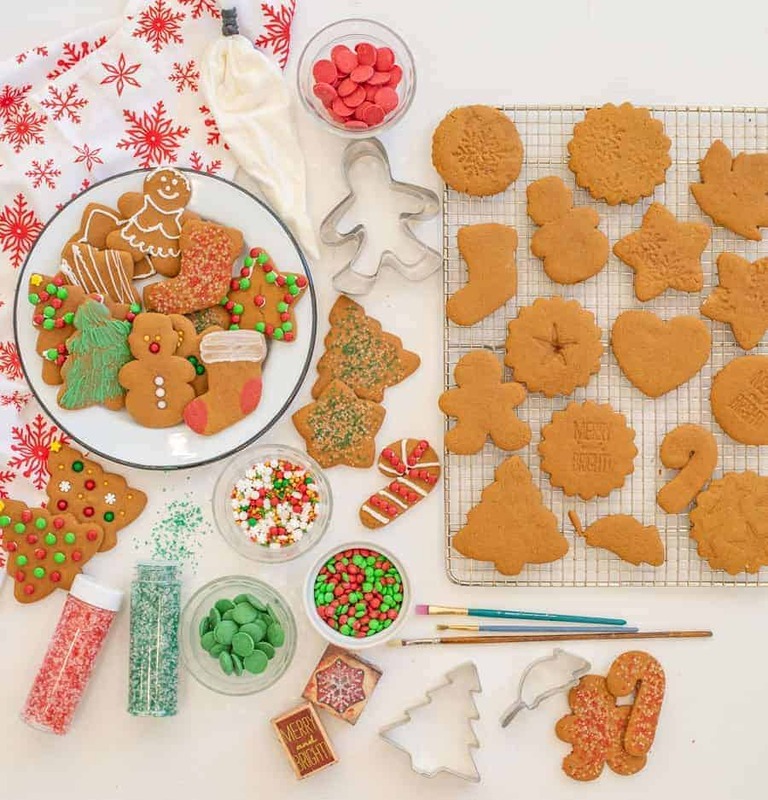 Decorate gingerbread cookies using candies. I love using seasonal candies to decorate cookies! In this case I bought a bag of holiday baking M&M’s and went to town. You can also use things like Sixlets and gumdrops. I used royal icing (as mentioned above) to “glue” my candies to the cookies. You don’t need much and they stick great! 3. 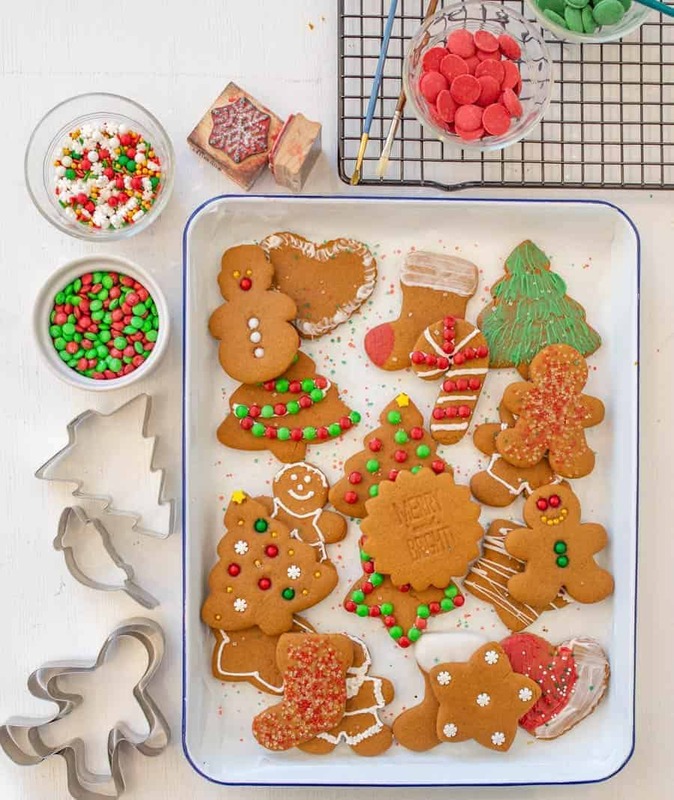 Decorate gingerbread cookies using sprinkling sugars. I LOVE using chubby sprinkling sugar (especially colored ones) for gingerbread cookie decorating. When you make the cookies, cut them out and place them on a parchment lined baking sheet. BEFORE you bake them, sprinkle with the coarse sugars and then lightly press them into the uncooked dough. Bake as directed and let cool. I think the texture of the sugar goes really well with the soft cookies. They look great, and (best of all) they are literally no more effort than a few shakes of the wrist before baking! Such an easy way to add a little flare to your holiday cookies. These are the sprinkling sugars that I used if you want to snag some. 4. 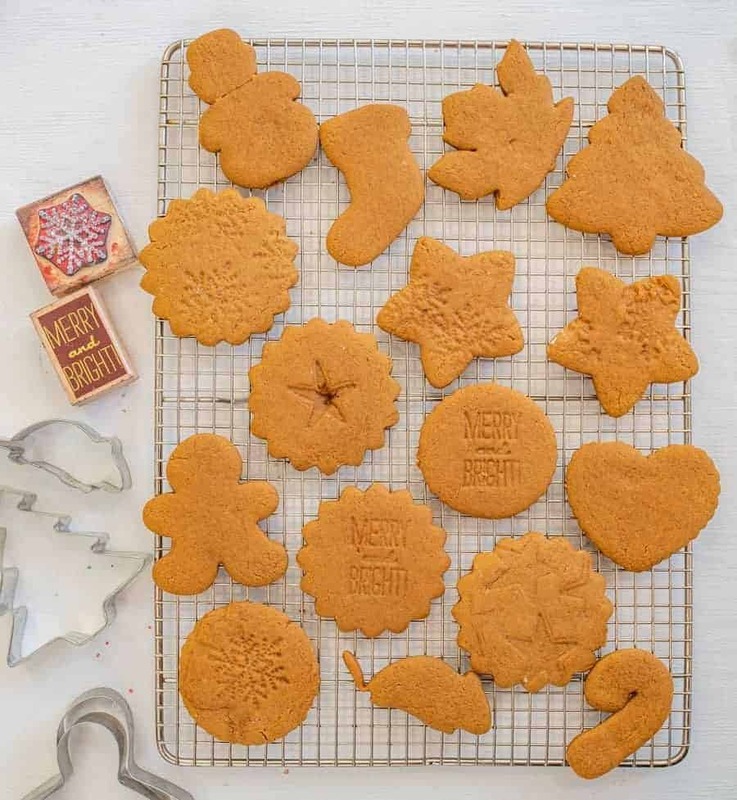 Decorate gingerbread cookies using rubber stamps or fancy rolling pins. How fun is this? I just washed some rubber stamps that I had with a little soap and water and then I pressed them lightly into the gingerbread cookie dough before baking. Then I baked it as directed and that’s it! I LOVE how simple and fun these turned out and you have so many options when it comes to stamps. I was surprised at how well the words came out and the snowflakes were so fun. You don’t have to go seasonal either, simple hearts or stars work too. My mom sent me the link to this fun holiday carved rolling pin (Danish inspired! Reindeer included!) and I think it would work great with this recipe! Have you ever used a carved rolling pin? I’d love to know if you like it! 5. 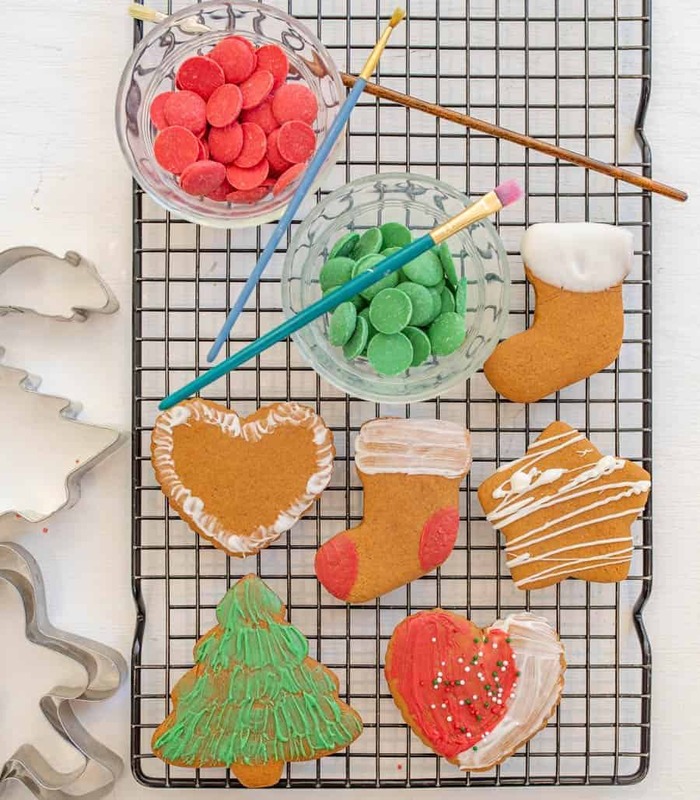 Decorate gingerbread cookies using candy melts and a paint brush. I had so much fun experimenting with this! I didn’t want to dip the whole cookie in chocolate or the colored candy melts; I feel like it changes the taste and texture of an already delicious cookie too much. So I decided to melt the candy melts in a small bowl and then used a good quality clean paintbrush to paint on the colored melted chocolate. It looked so pretty! You could also dip part of the cookie in the candy melts (like the top of the stocking) or simply drizzle a little over the top. Feel free to add a few sprinkles to the mix too. The idea here is that a little goes a long way and to not overload the cookie with too much chocolate or candy melts. 6. 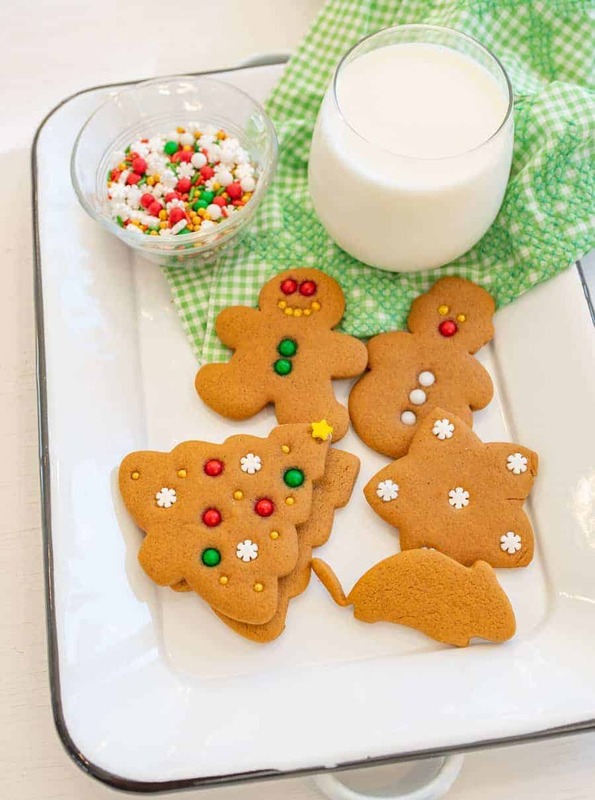 Decorate gingerbread cookies using cute sprinkles. Cute sprinkles are so much easier to find than they used to be. I used to order specialty sprinkles online or go to a restaurant supply store in Salt Lake City. Now you can pick them up almost every where and Wilton sells cute big sets of sprinkles (4 bottles per box) that you can find lots of places and they come in lots of varieties. I also have luck finding Christmas sprinkle mixes on Amazon that are lovely. Just look around! I pressed different sprinkles into the gingerbread cookie dough before baking and then baked as directed. Super easy and fun way to add a few little details to the cookies without much effort on your part. You might want to do a few test runs on the sprinkles though before you commit to a whole bunch of cookies. I found that a few sprinkles bled or melted when cooked, though lots were not affected by the heat. Bake them and see which you like best after they are cooked! 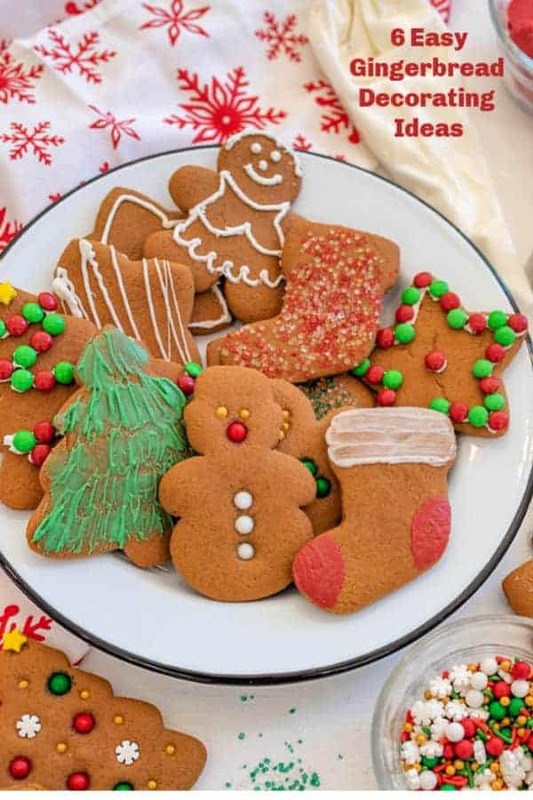 There you have it, 6 super easy tips and tricks for how to decorate gingerbread cookies for Christmas. 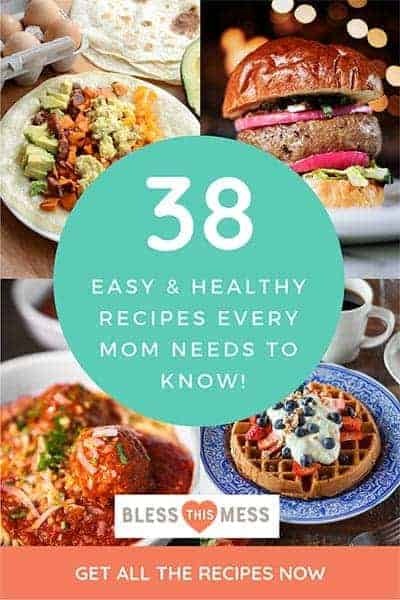 Nothing too expensive, time consuming, or hard to find AND all of them are kid-friendly. I love cooking projects that double as craft projects and gifts this time of year and this is one of my all-time favorites to make with my kids. Don’t forget to get my perfect Soft Gingerbread Cookies recipe to use with all of these decorating tips. Happy holidays my friends, happy decorating, and thank you so much for being here to enjoy so many recipes with me. These are super duper cute! I need some little people in my life so we can play with cookies! I have never seen a rolling pin like that…..I think I want one in my life!